Well darlings, I finally received my package from Rik Pierce with the missing chimney and wood I needed to complete my "Crooked House". I also received the owl brackets that fit under the front window upstairs. They are really sweet and will need to be painted. The resin looks pitted but I am sure these will look perfect once they are painted. As you can see from the photos, I still have quite a bit to do before I have a finished house. The hardest part is behind me though and now that the last of our Summer company has gone I can focus on finishing this up. In the last picture you can see in the corner where the two walls meet my paperclay has a gap. I need to put a small amount of glue there and add some paperclay to fill in the gap. I was really happy to see that my baseboards ended up at the right level when the house was put together. Less work at that point. 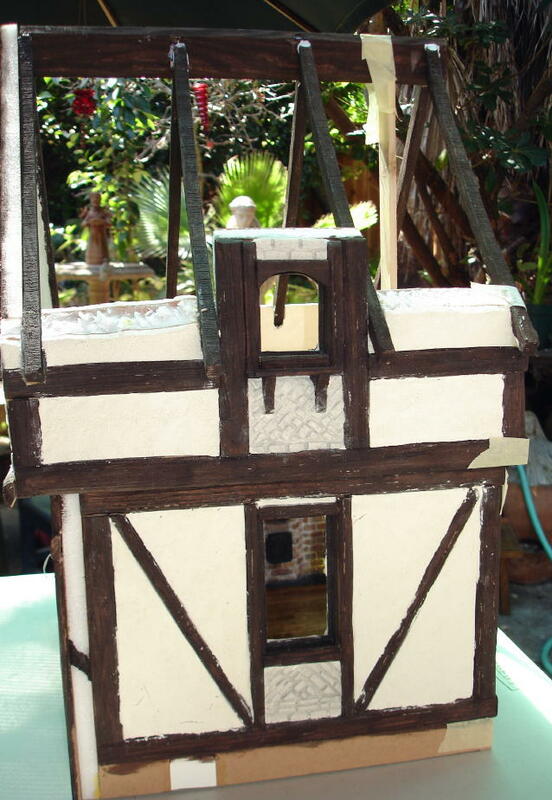 I have all of the wood for the roof prepainted and can start adding them. I also need to add a little more "wash" over my bricks. For a wash for your grout color it is about 1/2 cup water with 2 drops pf Hippo Grey and 1 drop of black paint added. You can adjust that formula to fit your needs. Once the bricks are completely painted I will add some more paperclay over parts of them so it looks like over the years it has fallen off, exposing the brick. It looks just wonderful! I just LOVE it!!! I have been hoping you would post pictures of it and continue your tutorials about how it was done. I am sure I will never be able to take a Rik class because he would NEVER come here and if i went somewhere to take the class I wouldn't be able to get the house home. It's looking so good already Patty!! I love it too! 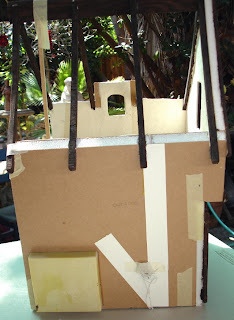 I'm thinking about maybe getting some kind of "dollhouse" kit, but after people's blogs of all that you have to do to put one together...yikes! I have a feeling my house would be a "crooked house" even if it wasn't supposed to be. I agree with the previous comments, it looks great. I'm looking forward to seeing more. It's a great kit and I love how it is developing! :o)) The fireplace is my favourite and I love how you have painted it. ;o)) The owl brackets are wonderful too. 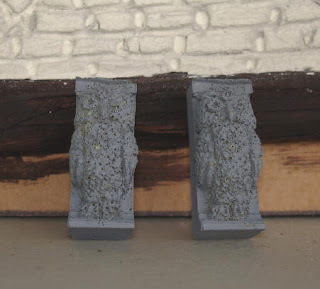 I have awful trouble cleaning up my beams after I've added my paperclay in-between, I use a damp cloth before its had time to dry and it STILL shows! Grrr! Thank you all for your comments. I think the beauty of this building will really start to show once I paint the individual bricks and put the wash on the stucco outside. Michelle, my wooden beams are a mess to. You just can't help getting some of the paper clay on them. I really noticed it after I took these pictures. 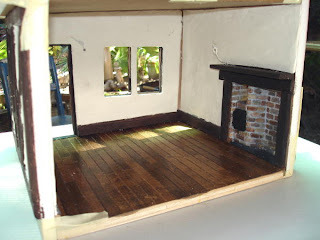 I plan to just carefully repaint the beams where needed and hope that covers everything up. Kristy, I bet you could make yourself a really darling dollhouse! 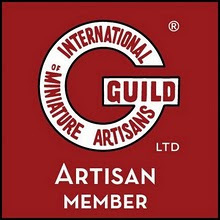 I have been disappointed with most of the kits available and think designing your own is the way to go. Surely Patty you can be disappointed in this house, can you? I am sure what you learned from the class would be enough, even without the end result being what I think is such a wonderful house. Patty, it looks GORGEOUS!!!! Love it! Muy buen trabajo. Esa brecha la solucionaras bien. Espero ver los avances. Catherine, No....I love this house! I was talking about all of those kits that look so alike and are made of luan wood. Thanks you so much Mercedes and Clara!! 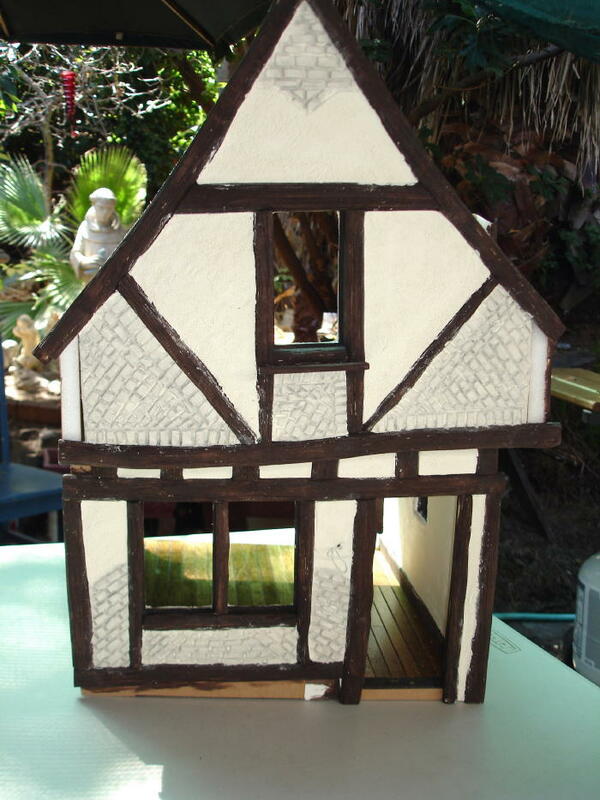 your Crooked House is comming out such great!! You have done a wonderful work ! You already know who will live in the house?